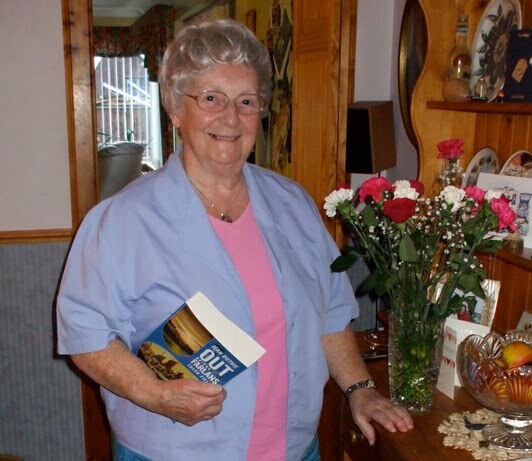 As I blogged earlier my aunt has just published her first book “Out of the Farlans: Fresh Fields” Since receiving a copy I have been rivetted to the book reading it in every spare moment. I have found the book both interesting and addictive and also very informative. The book concerns my auntie Jean’s family line stretching back to the 1800s but track the progress of her ancestors all the way through to her own mother Mary Bella. Mary Bella I knew myself (but always as Mrs Findlay) and of course I have first hand knowledge of Auntie Jean’s own generation, so reading the book I was able to put a face to many of the characters. Because of my personal knowledge of the people mentioned I also found it to be an emotional read for sure – particularly towards the end. I am not usually a reader – preferring to bury my self in technical manuals as opposed to fact and fictional stories. But this has been a real delight and an education. It was remarkable to receive an insight into the way my own ancestors might have lived. For example today we have the luxury of being able to communicate by voice text and even video at the touch of a button, but that was not the case in the 1800s and early 1900s when much of this book was set. That alone was a revelation and caused me to marvel at the things which are now possible through technology today. So many of these innovations we now take for granted but they were not always there. Electricity we now access at the press of a switch but in those early days even that was not possible…. In any case I would heartily recommend this book as a great and interesting read and would encourage all to take the time to read it. I also want to say a big thanks to my Autie Jean for taking the time and having the perseverance to complete this work – I know that this has been a huge effort on her part and it is wonderful to see her heritage preserved in this way. As you see below – even Abbie showed some interest!!!!!! Having been brought up in the Broch ( Fraserburgh ) and having memories of being a young lad around the herring drifters ( all be it from the motor boat version which two generation on from the sailing drifters which are mentioned in the book) – there is a lot in the book that I can relate to. I can hear the sounds of the harbour as I read the early chapters. I also have fond memories of heading out for a Sunday afternoon walk with my friends which we used to do often and the harbour was a regular haunt! I am currently about 1/3 through the book and will post again as I make further progress with my reading which I find is always easier when I am travelling.